As I was winding some embroidery threads onto bobbins yesterday, I realised I was almost out of them. Not being all that close to a craft shop, I pondered what to do. I noticed a couple of thin cardboard packets from chocolate blocks and realised they would be perfect for making some new bobbins. Bonus is that I am reusing cardboard. If you don’t have cardboard chocolate packets, have a look at what other recyclables are around your home. Tissue boxes would suit, the thinner packing put between new shirts and sheets, cereal boxes, tea boxes etc. * If you use cardboard that was from a food product, just make sure there is no food residue left on the cardboard. Step 1. Open and flatten your cardboard, and trace around an existing bobbin. Try to fit as many shapes onto your cardboard as possible – we may as well make as many as we can! 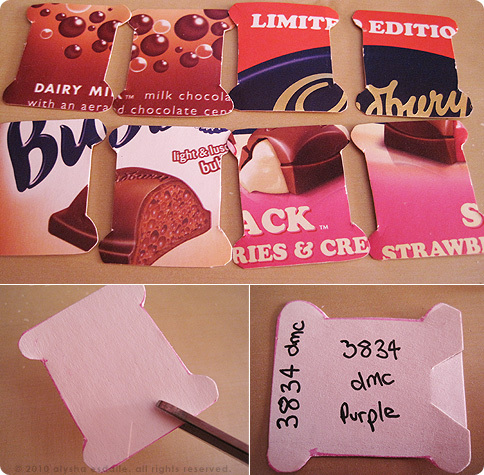 As you can see, I used the packets from Cadbury chocolate; enjoy the chocolate and then reuse the box. Mmmm. Step 2. Carefully cut out the bobbin shapes, using your tracing as a guide. On one end of the bobbin, make two small cuts in the shape of a ‘V’ which will allow you to tuck the ends of your threads away during winding. When I am about to start a new bobbin, I write the colour number plus the brand of yarn on one end as well as in the center of the bobbin. That way I can easily replace that colour when I am running low, or have just run out of the thread. Step 3. Wind some thread onto your bobbins. Hey presto! You have made some new bobbins and you have reused packaging. It’s all good! Feel like reading more creative posts? Head over to Kootoyoo for this weeks edition of My Creative Space. I co-ordinate my thread with the bobbin colour!!! That’s a jolly good idea, writing the info on the bobbin too. I shall do that in future.